WASHINGTON — Welcome to week two of the WTOP.com breakfast blog. First of all, I have got to say that you all are awesome! We got lots of great feedback — not to mention food for thought — and we look forward to answering many of your questions in future posts. I noticed a couple trends in your emails and comments on the blog. One trend is that a lot of you, like me, tend to grab breakfast on the run. Barbara Hufford told us on the talkback line that on work days she has a yogurt and a breakfast bar at the office, which is a pretty high load of sugar early in the day. 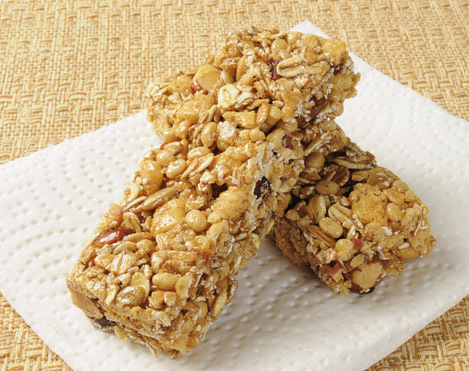 Nutritionist Lauren Trocchio is not a fan of breakfast bars, though she says they are OK in a pinch. She says if you are going to rely on them, opt for a bar that is higher in protein, and add in a piece of fruit or some string cheese to make it more substantial. Barbara didn't tell us if her yogurt is sweetened or unsweetened, nonfat or regular. Some yogurts are full of added sugars, so check the labels carefully. And keep in mind that they add a lot of artificial stuff to nonfat yogurt for texture. Low-fat is actually better, especially if you opt for plain yogurt and add your own fruit. Another idea from Lauren, for those of us who are short on time in the morning, is to prepare your breakfast in advance. And in case you were wondering, yes, she too has an outrageously busy life with two jobs — nutritionist at the Washington Center for Weight Management and Research, and sports dietitian at The George Washington University. One of her favorites is crockpot oatmeal — scoop some into a container, add some milk, maybe some almonds or a few raisins, and nuke it at the office. Another, which is especially good for summer, is simply soaking oats overnight in yogurt or milk and then adding whatever fruit is handy (cut up apples are especially good). Next week we'll talk about another breakfast fave for those on the go: a fruit smoothie. Are you a smoothie fan? What do you put in yours? And don't forget, I love to hear your voice, so be sure to leave a message on the talkback line. Call 844-282-1035.